The appendix is a narrow blind-ended tube that is attached to the posteromedial end of the cecum (large intestine). It contains a large amount of lymphoid tissue but is not thought to have any vital functions in the human body. In this article, we shall look at the anatomy of the appendix – its anatomical structure and relations, neurovascular supply and lymphatic drainage. 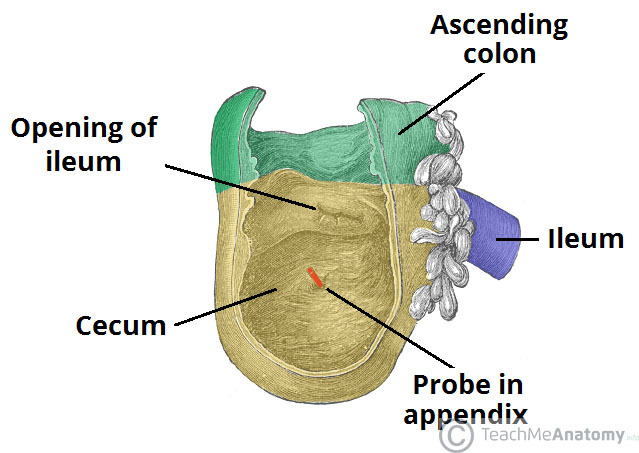 The appendix originates from the posteromedial aspect of the cecum. It is supported by the mesoappendix, a fold of mesentery which suspends the appendix from the terminal ileum. Pre-ileal – anterior to the terminal ileum – 1 or 2 o’clock. Post-ileal – posterior to the terminal ileum – 1 or 2 o’clock. 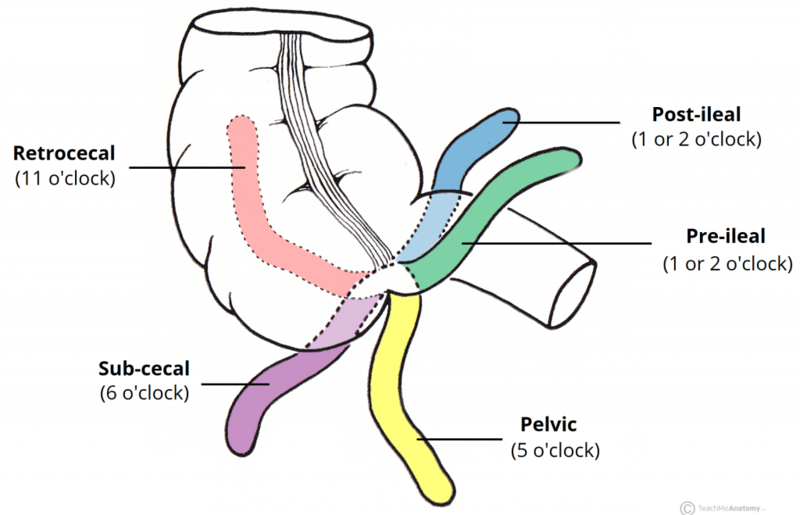 Sub-ileal – parallel with the terminal ileum – 3 o’clock. Pelvic – descending over the pelvic brim – 5 o’clock. Subcecal – below the cecum – 6 o’clock. Paracecal – alongside the lateral border of the cecum – 10 o’clock. Retrocecal – behind the cecum – 11 o’clock. Fig 2 – The common positions of the appendix. The most common position is retrocecal. The appendix is derived from the embryologic midgut. Therefore, the vascular supply is via branches of the superior mesenteric vessels. Arterial supply is from the appendicular artery (derived from the ileocolic artery, a branch of the superior mesenteric artery) and venous drainage is via the corresponding appendicular vein. Both are contained within the mesoappendix. Sympathetic and parasympathetic branches of the autonomic nervous system innervate the appendix. This is achieved by the ileocolic branch of the superior mesenteric plexus. It accompanies the ileocolic artery to reach the appendix. Note: Of clinical relevance, the sympathetic afferent fibres of the appendix arise from T10 of the spinal cord – thus explaining why the visceral pain of early appendicitis is felt centrally within the abdomen. 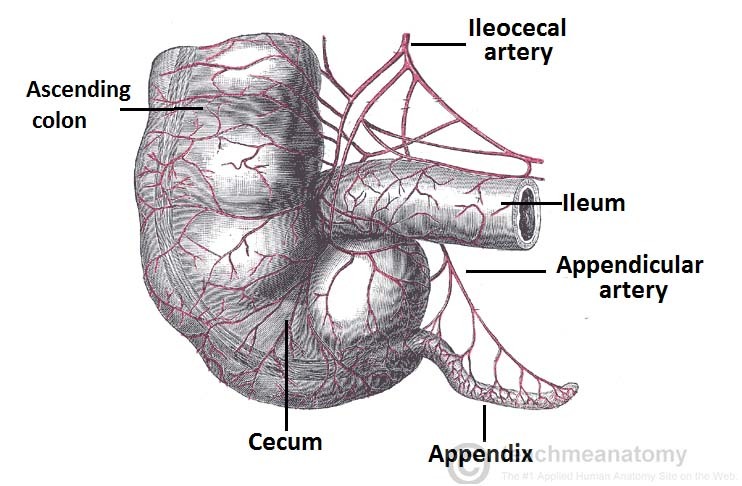 Fig 3 – Arterial supply to the cecum and appendix via the ileocecal artery. 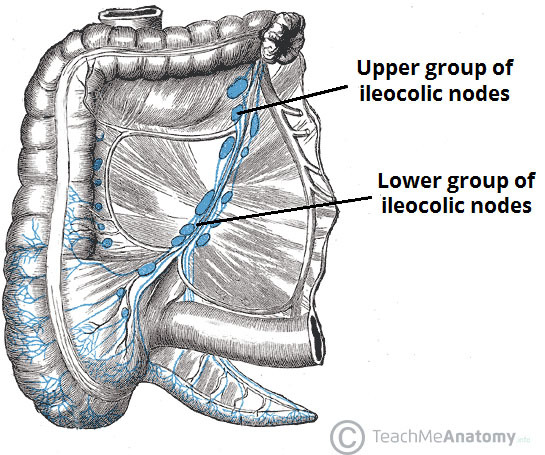 Lymphatic fluid from the appendix drains into lymph nodes within the mesoappendix and into the ileocolic lymph nodes (which surround the ileocolic artery). Fig 4 – Lymphatic drainage of the cecum and appendix. Inflammation of the appendix is known as appendicitis, and is a common cause for acute severe abdominal pain. In established appendicitis, the abdomen is most tender at McBurney’s point – situated one third of the distance from the right anterior superior iliac spine to the umbilicus. This corresponds to the location of the base of the appendix when it lies in a retrocecal position. The aetiology of appendicitis depends on age. In the young, it is mostly due to an increase in lymphoid tissue size, which occludes the lumen. From 30 years old onwards, it is more likely to be blocked due a faecolith. Initially, pain from the appendix and its visceral peritoneum is referred to the umbilical region. As the appendix becomes increasingly inflamed, it irritates the parietal peritoneum, causing the pain to localise to the right lower quadrant. If the appendix is not removed, it can become necrotic and rupture, resulting in peritonitis (inflammation of the peritoneum). A surgeon struggles to identify the appendix during laparoscopy. What is the most common position of the appendix? What is the embryonic precusor to the appendix? The arterial supply to the appendix is via the appendicular artery. Which vessel does it directly arise from?